None of those XP rewards you mention are in this game. It's only Quest xp. I would be happy with exploration and achievements on top of Quests as a compromise but that isn't even on the table. As far as I know, those are definitely on the table. Just not implemented yet. I don't recall hearing confirmation for or against this, but it doesn't sound like something that wouldn't have been implemented by this time I would think. Anything they give us other than quest xp is fine with me, though. Also, shout out for Truro folk. Not exactly a big online presence, but I know plenty of people who take game design at the Truro campus. Which Infinity Engine game are you talking about? We were promised a spiritual successor to Baldur's Gate and this game doesn't resemble it at all. Baldur's Gate was our target title for what we wanted Project Eternity to be. It felt like Baldur's Gate encapsulated all of the elements we were shooting for. 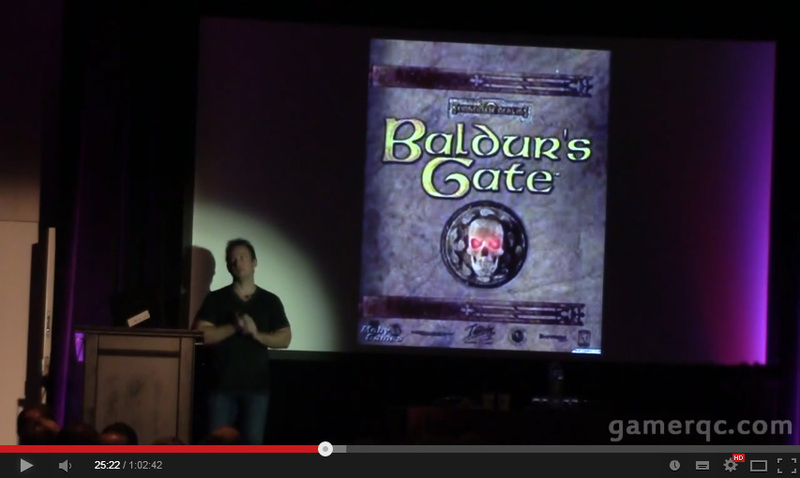 We felt that a number of players out there missed that Baldur's Gate experience and would want to see it again. And when we launched our Kickstarter: Boy, were we right! The game is so full of Sawyerisms that it has nothing to do with any of the Infinity Engine games anymore. Looks like they failed to meet their design goal if you ask me. Nope, quest only XP has been confirmed. And the fact that it takes a lot from 4E makes it 10X worse than it would be otherwise...possibly the worst part of Sawyerism. All this talk of Baldur's Gate encouraged me to load up that game again and give it a full play through. What I can comment upon with this experience fresh in mind is how (a) having kill xp part of this game made certain playstyles more enjoyable. The loan wolf thief. The loan wizard. The loan warrior, etc etc. Doing all of this plus the (b) a strong second reason that there were flat out dozens and dozens of areas that had no direct quest involved yet you could decide to go there and have a tangible reward for the risk. Maybe even a compelling role reason; paladin defeating forces of evil etc. Will POE have places that have zero quests involved as worthy to visit as Baldur's Gate? Or will these experiences be worth nothing--no compelling reason--no real chance at a risk vs reward but instead merely squandered resources. Edited by Nomadmerc, 27 August 2014 - 08:06 PM. The loan wolf thief. The loan wizard. The loan warrior, etc etc. The Loan wizard is able to re-mortgage your house with a wave of his wand. I propose a pretty unorthodox way on solving the "XP" issue. Take a look boys. First, let's take that Ogre quest as an example and say it gives 1000 XP upon completion. Now follow me here, carefully. Anything you do towards the goal of the Ogre quest gives XP incrementally and caps at 1000 XP. Let's say you manage to only do conversations to complete the quest. Then all those conversations will give you XP that ultimately add up to 1000 XP. However, let's say someone else decided to fight everything in their path, all those battles they fought would add up to 1000 XP eventually. Oh, you're that player that fought through to get the Ogre, but was able to convince him of avoiding a fight? Well bravo, you are rewarded with XP too. You get XP from your combat and conversation...still adds up to 1000 XP! So you see, NO ONE LOSES in this system. Basically, each quest has a "XP Meter" that fills until you max out its meter which essentially means you completed the quest. You can fill that meter with anything that rewards XP, so combat, disarming traps, conversations, etc. are all valid means of obtaining the necessary XP to complete it. However, the ball is in your court of how you decide to complete the quest. Just know that you will get XP from WHATEVER you do. A great thing about this XP system is that you can't "game" it in a sense that you will do EVERYTHING to get as much XP as you can. It's balanced in the sense that the quest can only give a certain amount. What do you guys think about this system? It doesn't really seem hard to implement! Edited by TrueMenace, 27 August 2014 - 08:34 PM. This is almost exactly what I proposed in one of the other threads. There were some dissenting opinions though. Can't recall exactly what the issues were that they pointed out, but I'm sure you'll hear some of them. At least it's in. For the ogre quest there's XP at least for entering the cave, then for dealing with the ogre. AFAICT you don't actually get any more XP for reporting back to the farmer, you just get the money and the gun, and Piglet of course. We're just bored of the ... "discussion." @TrueMenace @Ink Blot The problem with your proposed system is that (a) it ends up in the same place as quest XP, but (b) it's a lot more complicated. You'll have to keep track of which monster "belongs" to which quest(s), account for situations when someone kills them before any of the quest(s) have triggered, and so on. In addition, it'll make the reward system feel inconsistent: you'll get an XP reward for killing these beetles now, but if you kill the other identical beetles on the way back after you've filled your XP meter by persuading the ogre to become a vegetarian, you won't get any XP. I.e., it would be significantly more work to implement and especially test (how do you test for all possible orders in which players could take on quests and kill monsters?) and it would lead to a system that will feel erratic an unpredictable even if it works perfectly since sometimes you would get XP for killing things, and sometimes not. Edited by PrimeJunta, 27 August 2014 - 09:04 PM. People who agree with the current implementation, like me, are way less vocal, as it happens in all the discussions in the world. I would be fine with this system. But I foresee some issues in implementation. Nevertheless, I would like it much better than quest-only. Err, this is quest only but disguised as kill XP. In BG, you get 650 XP for killing a wolf. In the disguised quest XP system sometimes you get 650 other times nothing because the meter filled up. If the encounters were designed so that the sum of the kill XP was always less than or equal to the quest XP, then at least you would get an XP reward for each kill. But, it wasn't designed that way. If it had been, there would have been another ****storm when people moved the difficulty slider to a harder mode and now got less XP per kill (because there are more creatures on harder modes). This is only one of the problems with this scheme - there are more if you think about it. They stem from the basic problem is that it is a pretend kill XP system and not a real one. This is pretty much where my last post at the very start of these forums was left of. I believe that most backers of project eternity wanted more and new content of the same style of game. Far to much focus have been on new races and mechanics, without anybody asking for it. I hate getting xp off of beetles, and am glad there isn't combat xp. That being said, it should be slightly diversified. Get discovery XP for finding it, getting rare mob xp for killing it, and quest xp for turning in the head. Instead of right now, only getting quest xp for finding it and for killing it. Ribbing Josh or any attempts at Being Josh Sawyer, getting inside his head and hunching around on 7 1/2 floor are futile. And like others have said, he's absolutely great at what he's doing. Fallout: New Vegas alone says it all. It also bears repeating, as someone that's modded CRPGs a lot: It's all within the realms of clear possibility to insert an xp system of the kind found in the IE games before their estimated ship date at the end of this year. Don't believe anybody telling you otherwise. Edited by IndiraLightfoot, 27 August 2014 - 11:14 PM. Do we really need another thread deticated to this topic? No please. This one, started by a moderator, will suffice.